Enter this month's Where on Earth contest here! What do you think is the most significant earth science news story of the year? From Sumatra to the Gulf Coast, natural disasters remind us of the dynamic forces at work on Earth and our growing responsibility to understand and address them. Global-scale models and observations are sharpening scientists' view of a dramatically changing climate. Energy has been in the spotlight in the wake of Gulf Coast hurricanes, peak oil predictions and increased worldwide demand. New techniques and fossil finds are shaping understanding of life's patterns through time. Planetary geologist David J. Stevenson talks about the biggest discoveries in space over the past year. With increasing public attention on nonscientific alternatives to evolution, museums and parks are getting more aggressive in teaching visitors what science is and is not. Protecting a city that lies in a delta such as New Orleans is an uphill battle against the laws of nature. As the federal deficit grows, so too does concern over fiscal priorities in Congress. The devastation in New Orleans raises serious questions about (re)developing coastal areas. A set of earthquakes in the Midwest sets off a busy winter of seismic activity in the center of the United States. 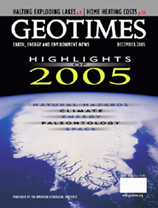 Cover designed by Mark Shaver; image copyright Digital Vision Ltd.
Tyrannosaurus rex head photo courtesy of University of California Museum of Paleontology; Hurricane Wilma photo courtesy of NASA/MODIS Rapid Response Team at Goddard Space Flight Center.